December 20, 2011 by Venky. The day two has kicked up the excitement big time. The guys were getting into the groove enjoying the ride and racing in the competitive sections. 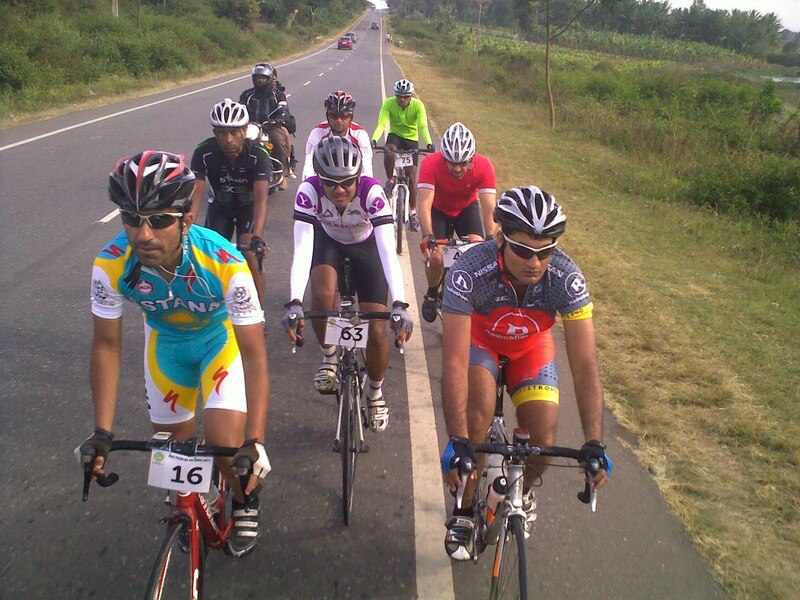 The day three ride from Hassan to Madikere was going to be the longest ride of TFN this year. It is also touted as one of the toughest rides with a 10km climbing competitive section after riding 170km of rolling terrain. Everyone was nervous about the ride from day one and with good reason. This was going to be a long day. The breakfast menu of bread, boiled eggs, broached eggs, chicken sausages, idli, vada, pongal, kesari bath, fruits, fruit juice etc., catered to most cultures and tastes while providing enough wattage for the ride ahead. The breakfast, lunch and dinner menus seemed pretty well thought out. They have been distinctive and I think they have been serving the nutritional needs of the riders, so far, while still catering to their taste buds. I loaded up on some much needed protein. I would need it. Amrish, Shankar, Arvind, Raman, Mark and Ameet on the way to Madikere.. It was slightly cold as we started around 7:30am but as we got out of Hassan, the sun came out and turned it into a beautiful and warm morning. The plan was simple. 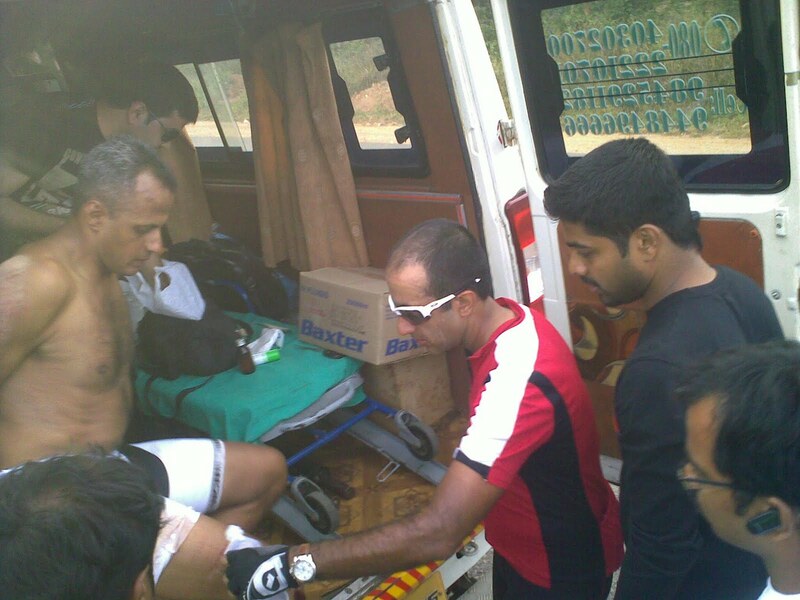 Save the legs, if at all that is possible after riding 170km, for last 10km climb into Madikere. So there was hesitancy to spend time at the front in most of us. But the train has to move forward and we tried to share the load as much as possible with out taxing the top guys too much. We rode at a very easy pace and were going strong at SS2 which at 90km mark was exactly halfway to the end. The plan was to get to SS3 at around 135km mark, which was also the lunch stop, reasonably early and rest there for a while before we get to the competitive section. That would mean that we won’t be climbing the competitive section in the hottest time of the day and we would give the legs time to recover and be ready for the mayhem ahead. Baba Velo, Ravi Ranjan, MarkH, Rakesh, Vandit, Sumit, Maninder, Vijay, Vicki, Hari and I were riding together sharing the work. We got to the SS3 at around 1pm feeling reasonably fresh despite the long rolling terrain and headwinds. 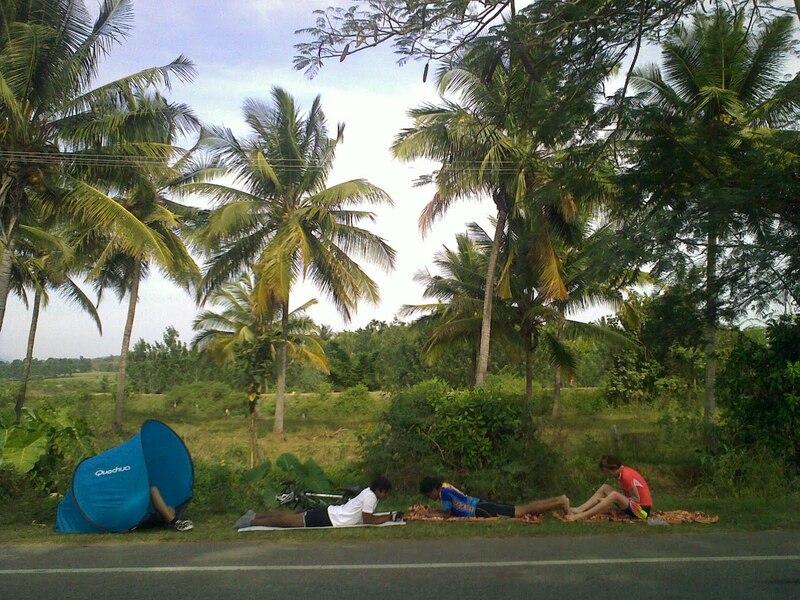 We had pasta and bread for lunch and stretched out by the roadside and slept like babies under tree shade. After a while, the spectrum group of Arvind, Gaurav, Amrish, Ameet and Siva arrived and we waited for them to get their lunch and rest before we all start together. We spent almost 2hours at SS3 before moving ahead. It was a huge bunch of nearly twenty gently moving along towards SS4 where the CS starts. Roadside resort.. Akshay in the tent while Ravi, Hari and Vicki made to with some blankets on the grass..
Just a few kms before the SS4, as we were going through some beautiful forests with excellent rolling terrain, Raj, Rakesh, Sumit, Mark and I charged ahead to warm-up on the inclines with some short hill sprints. As we got to the start of the CS, we were raring to go. We regrouped at the CS and decided on the order of people to start so that we can act as carrots to each other. That is becoming the theme since the races are individual time trails and this way each of us will have someone to chase and do better. Ravi started before me and Rakesh, Mark and Sumit started after me followed by Raj. The countdown has started and I charged ahead and tried to settle into a rhythm. Baba Velo predicted a time of around 30mins for me before I started but I didn’t want to look at the time and put myself under pressure as I rode. So, I’ve decided to take it by how the legs respond and look at only the heart rate. It was difficult to gain momentum initially but as I settled into a rhythm the heart rate slowly ramped up and I kept going keeping it steady at around 170. I was looking to go all out because the end of the CS is the end of the ride for the day. But at the same time I did not want to put too much strain on the legs in that adrenaline rush because we still have great bit of climbing to do on the tour. As I kept going the breathing has turned into loud panting. I went past a couple of riders who have started before me but I could only get a glimpse of Ravi a couple of times riding ahead. He has started a minute before me and my target was to get as close to him as possible. But I could hardly see him more than couple of times with the course being so winding and as he was riding pretty hard himself. That target of getting close to him kept me distracted from the pain of the hard effort of the climb. The climb looked to be a continuous 10km climb according to the elevation profile shown in the dockets. But it actually had quite a few flat/downhill stretches that gave respite to the legs. Even that helped to keep going with a few seconds of respite in between. The 2-3km of flat/downhill stretches in the 10km with 300m of elevation gain meant that it was not a steady 3% gradient and the climb got steeper at a few places. Those downhill stretches in between were also very winding and technical. I just spun through them as hard as I could with out using brakes as I knew the climb would start again. As I was going through one such downhill stretch I saw Vandit stopping by the roadside getting off the bike to look towards his back wheel. I couldn’t make out what was wrong but I kept going. As I approached the 8km mark, I heard the noise of some wheels approaching and before I could finish wondering who it was, I heard the sonic boom going past me. It was Baba Velo. I heard, “Keep going, Venky!” and he was gone disappearing into the next curve as if I was standing still. That egged me on further. When I saw some marking on the road saying 3km to go, I started thinking, “Oh Man! 3 more! ?” But soon I saw ‘1km to go’ written on the road and went all out with a mental sigh of relief that it is soon going to be over. The pain is going to end and I can breath normally again. I charged to the finish line and crossed it elated. I was happy with the effort and that it was over for the day. The rest of the guys one by one sprinted to the finish line. Sumit who got there told us that Vandit crashed big time and his bike is broken. As we were all wondering what really happened, we saw someone who looked like Vandit sprinting to the finish line but he was on a much smaller Bianchi. Someone said, it’s not Vandit but the black and white Assos set was unmistakable. That person turned back and approached us and got of the bike limping and there was blood all over him. It was Vandit indeed. The bike was not his. It was an incredible sight. He looked like a wounded warrior. Apparently on a fast downhill section when he was going full throttle, his rear tire hit a small stone got a pinch flat which sent the bike fishtailing for a few meters before crashing. He then got up and ignoring all the lacerations on his body changed the tube and tried to get on the bike and start riding. He then realized that the rear derailleur is broken. Narayan on his Bianchi Nirione 7, who was passing by stopped and apparently offered his bike so that Vandit could finish the ride. He got on to the bike and put all the adrenaline from the crash to propel the bike towards the finish line and sprinted past it. It was pure Jens Voigt stuff from him. Hats off! Jens being treated by Dr. Arvind in the ambulence.. 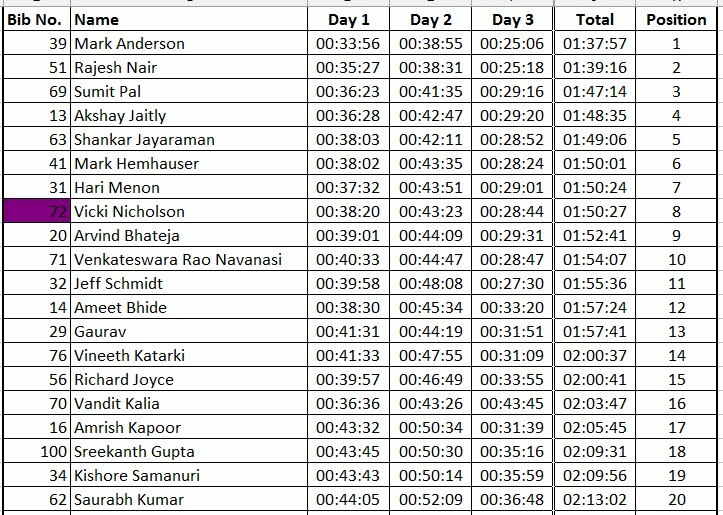 He has lost almost 15 mins due to the incident and ended up sliding to 16th position in GC at the end of 3rd day from 5th position on day 2. I was really happy with the way the climb went for me. 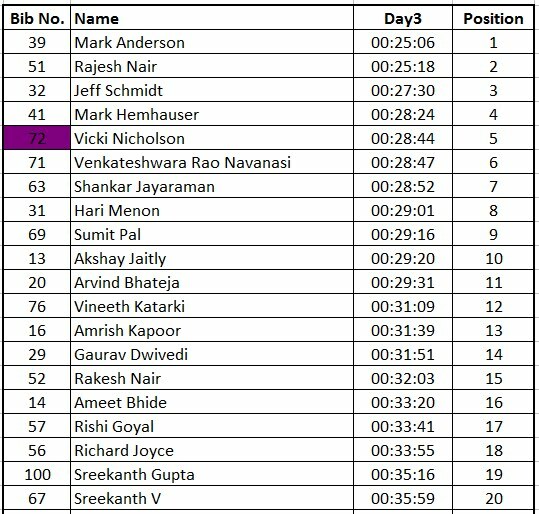 I completed the 10.5k section with 300m climb in 28mins 47secs finishing 6th overall for the day. Mark Anderson finished 12 secs ahead of Baba Velo with a time of 25 mins 06 secs. Mark is still 1 min 19 secs ahead in GC after day3.